Portable Kanban is a Personal Task Manager created by Dmitry Ivanov. This Portable Free Personal Electronic Kanban Software might be used to help schedule and track your daily events or tasks and to monitor assignment productivity. Features include the ability to setup topics and columns however you like, assign tasks to certain people, keep track of time via the work timer, set breaks via pause, and much more. 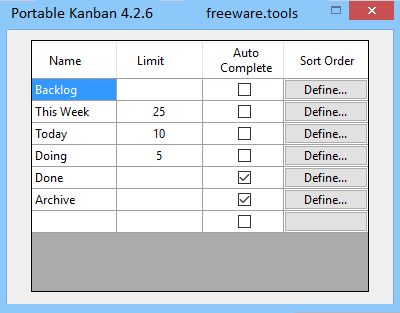 Portable Kanban uses an XML file to store it's data. This Portable Personal Electronic Kanban Software is focused on applying the core principles and techniques of Lean manufacturing to your personal work. If your schedule is overflowing and you are trying to organize your projects in a more efficient manner, you probably heard about the Kanban scheduling system. However, instead of using a physical board, which takes space and consistently uses resources, you can rely on third-party software such as Portable Kanban that can help you achieve quicker, more efficient results. You do not need to install this program on your computer, as just decompressing the contents of its archive and launching the corresponding executable grants you full access to its functions. More so, it is possible that you can run it from removable storage media such as USB flash drives or external HDDs, as well. Additionally, it does not tamper with your registry entries, nor does it create additional files or folders on your PC. This program comes with a comprehensive user interface that encompasses many functions, which can be easily accessed directly from the main window, without having to browse endless menus looking for them. Furthermore, this program also offers you a handy configuration menu, where you can adjust various settings and make the application more suitable for your needs. Portable Kanban lets you create tasks and organize them by providing you with a virtual Kanban board layout. Creating a task can be easily accomplished by clicking the plus-shaped button in the main window and type the required information in the designated fields. You can type a title or a description of your task, create subtasks, choose its topic, column, assignee, priority or points, select a deadline and assign it a link or a file from your computer. More so, it is also possible to add comments and use time-tracking features to monitor yours or your assignees' progress. All in all, Portable Kanban is a reliable virtual Kanban board that enables you to generate and organize your tasks by providing you with all the necessary tools. It comes with a comprehensive user interface, packs intuitive functions and lets you customize your tasks and even use time-tracking features for them.